Student participation in the annual UM-Flint Corporate Case Competition more than doubled from the inaugural event last year. The impact and scope of the competition extends even beyond this significant jump in student involvement, organizers said. One month after the competition kicked off, students from a wide range of academic disciplines gave presentations on their research and findings February 20 at the Northbank Center ballroom. The participating companies included Plante Moran, Al Serra, Chemical Bank, Consumers Energy, Mass Transportation Authority, Laird Technologies, Quicken Loans, C3, GM, 100K Ideas, Pioneer State Mutual Insurance Company, and Webasto, which was the presenting partner. “The competition allows students to apply their classroom theoretical learning in the corporate world, and it gives them an opportunity to distinguish themselves,” said Sara Barton, one of the event organizers and manager of the UM-Flint Career Center. 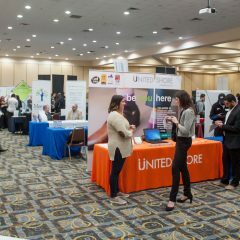 Claus Weimann, of the UM-Flint Education Abroad Office, and one of the event organizers, said the connections with the corporate partners helps create internship and job opportunities for students. 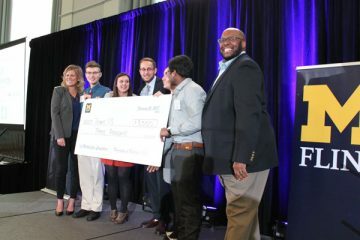 The companies received ideas from the students and tapped into the talent of UM-Flint. 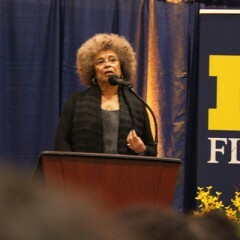 The event drew both graduate and undergraduate students from an array of fields. Students explored a wide range of issues, such as leadership opportunities, year-long outreach to employees, employee support strategies, peer-to-peer recognition, and volunteer initiatives. Each member of the winning group received a $500 scholarship. Alhana Khobeir, a UM-Flint student in the Honors program studying research psychology participated on the team that earned the scholarships. Khobeir, who recently earned a bachelor’s degree at UM-Flint in molecular biology, said the event allowed her to work with students from a wide spectrum of backgrounds. The other members of the winning group are Audrey Beauchesne, Zachary Hayes, Sai Pradeep Chebrolu, Mohammed Alsarraj, and Jami Blaauw-Hara. 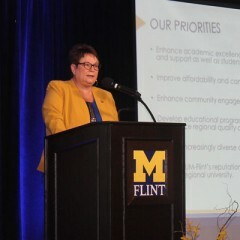 Tanya Upthegrove, of UM-Flint’s Division of Student Affairs, was one of the judges for the competition. She lauded the students for their ability to work well within diverse teams. “It is a transferable skill that stays with them at UM-Flint and within the workforce as well,” said Upthegrove. Philipp Schramm, chief financial officer and VP of Human Resources and IT at Webasto Roof Systems, said the competition is progressing for everyone involved. “We have benefitted from the ideas and hard work the students have put into this project,” he said.